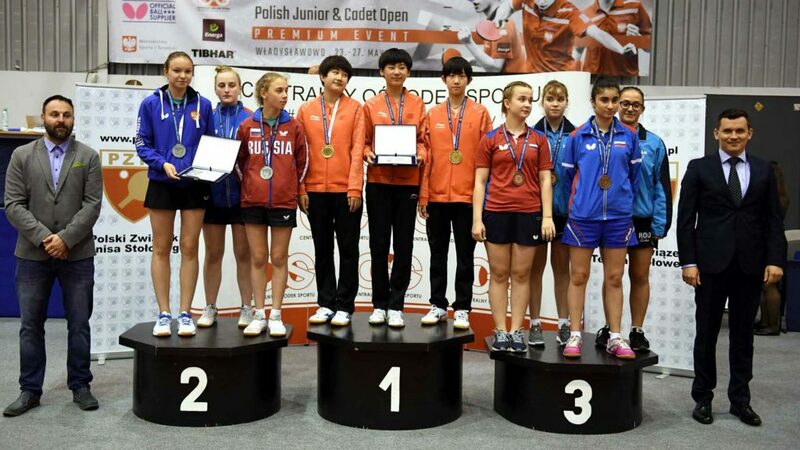 Titles secured and secured in style, China emerged successful in both the Cadet Boys’ Team and Cadet Girls’ Team events at the 2018 Polish Junior and Cadet Open in Wladyslawowo-Cetniewo on Saturday 27th May. Xiang Peng and Kuang Li proved a most formidable pairing; on the ITTF World Junior Circuit in Thailand Kuang Li had beaten Xiang Peng in the Junior Boys’ Singles final, in the immediately ensuing Cadet Boys’ Singles title decider they had met again; Xiang Peng reversed the decision. Furthermore two days earlier in Poland, Xiang Peng had been crowned Junior Boys’ Singles champion. Otherwise, it was three-nil victory margins in every encounter. In the penultimate round they beat the Poland ‘A’ Team pairing of Kuba Kwapis and Maciej Kubik, before securing the title at the expense of Belgium’s Adrien Rassenfosse and Nicolas Degros. In the opposite half of the draw Adrien Rassenfosse and Nicolas Degros had accounted for the Romania ‘A’ partnership of Andrei Tomica and Julian Chirita prior to ending the hopes of the German ‘A’ Team comprising Jeremy Loeffler and Hannes Hoermann. Impressive from Xiang Peng and Kuang Li, it was even more impressive from their female counterparts, Chen Yi and Li Yuqi in the Cadet Girls’ Team competition; not one individual match was surrendered. At the quarter-final stage they beat Germany’s Sophia Klee and Naomi Pranjkovic followed by a semi-final success in opposition to Russia’s Elizabet Abraamian and Arina Slautina to the reserve their place in the final. Success against one Russian pair, in the final it was success against another; they beat Liubov Tentser and Alina Zavarykina to arrest the title. Defeat for Liubov Tentser and Alina Zavarykina but it had been a most creditable performance; in the quarter-final round they had beaten Lithuania’s Kornelija Riliskyte and Emilija Riliskyte by three matches to nil before recording a three-one success in opposition to Romania’s Luciana Mitrofan and Elena Zaharia. Team events finished, play concludes on Sunday 27th May with the Cadet Boys’ Singles, Cadet Girls’ Singles, Cadet Boys’ Doubles and Cadet Girls’ Doubles events.